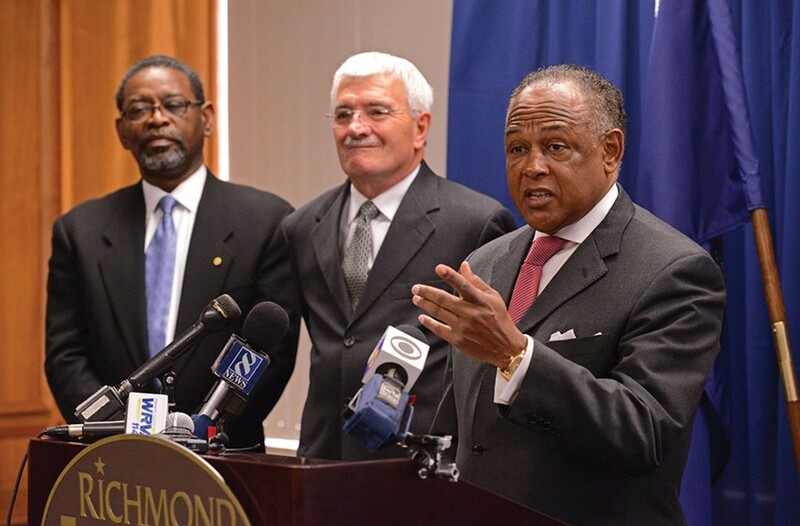 2013 Richmonder of the Year: Mayor Dwight C. Jones | Cover Story | Style Weekly - Richmond, VA local news, arts, and events. After a low-key first term, the mayor becomes the risk-taker he always warned us about. Is this the beginning of Richmond’s next transformation? 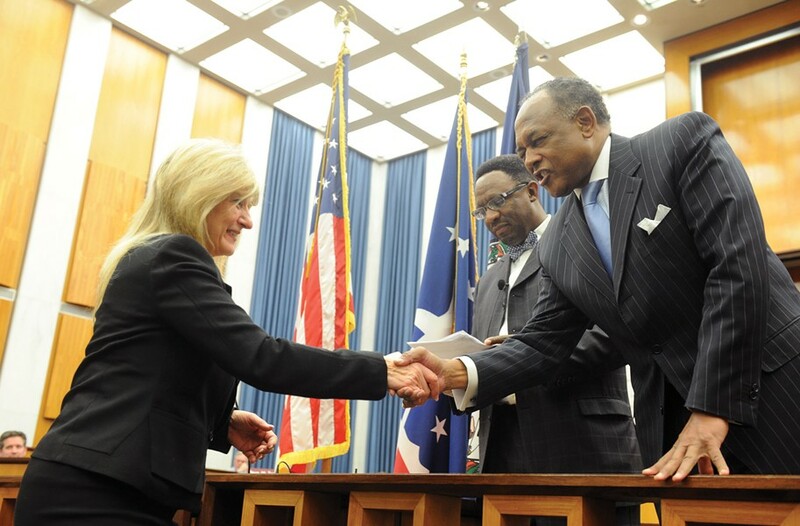 Mayor Dwight C. Jones was sworn into his second term in office Jan. 12 after steamrolling his lone opponent. Whether lack of serious competition offered the mayor his mandate or made him less responsive to his constituents is a matter of perspective. In either case, the consensus was that he'd fulfilled voters' chief first-term requirement: Don't go the fractious route of Mayor L. Douglas Wilder. A mayor is the political face of a city, and Jones, neither flamethrower nor glad-hander, showed Richmond what it asked for: gravitas. A preacher's straight-backed, solemn-faced deliberation. "Together we will build a better Richmond," is the mayor's mantra. As slogans go, it is as he is: direct and decidedly understated. Jones plays his cards close. But things changed in 2013. There was the launch of the Maggie Walker Initiative for Expanding Opportunity and Fighting Poverty, the opening of the Redskins Training Camp, the unveiling of the redevelopment and ballpark plan for Shockoe Bottom. The projects bookended a year of ribbon-cutting ceremonies for a downtown work-force center key to his anti-poverty initiative, new schools and housing in long-neglected city neighborhoods and another upgrade in the city's bond rating. Mayor Dwight C. Jones revels in the grand opening of Redskins Training Camp on July 8. What followed was a three-week spectacle of feverish fandom and boosterism, though it’s uncertain whether the city will recoup a near $15 million investment. It's too soon to know what will come of all this. But for an incremental mayor, 2013 was a turning point. Jones laid claim to shaping what Richmond will become. In doing so he waded into some of Richmond's most divisive issues: past and future, rich and poor, black and white. He shook things up. Critic or supporter, you know the direction he's headed — what some people refer to as leadership. The Rev. Ben Campbell, who offered the invocation at the mayor's second inauguration, calls 2013 "the year Jones came into his intentions." 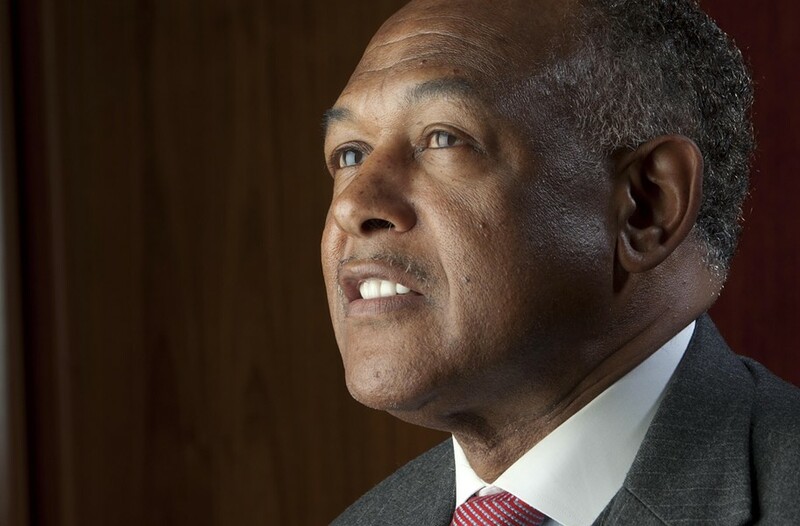 For acting on his big ideas, making his big plays and taking a stand, Style Weekly names Mayor Dwight C. Jones as its 2013 Richmonder of the Year. "What the year says is that it's possible," Jones, 65, says. "Richmond is pregnant with possibility and potential, and the question right now is, 'Are we willing to embrace it?'" Jones unveils the most controversial proposal of his tenure thus far on Nov. 11: the relocation of the Flying Squirrels double-A baseball team to Shockoe Bottom. 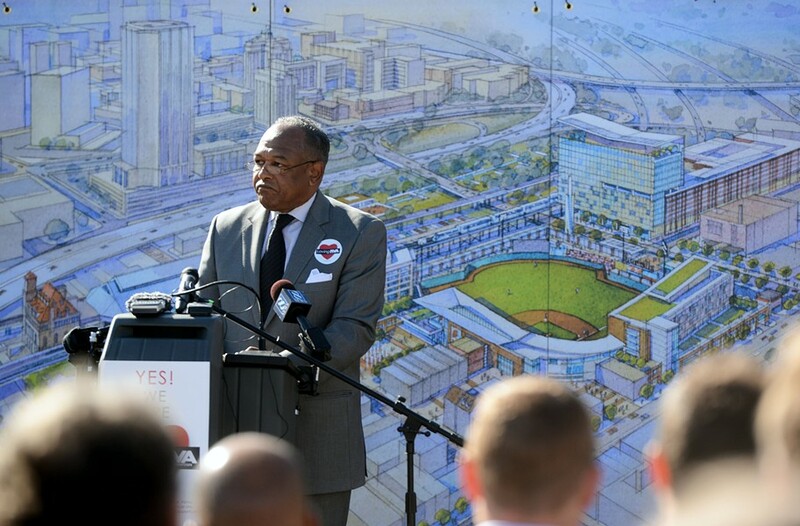 Jones’ plan calls for a new city-financed ballpark within a stone’s throw of known archeological slave sites, anchoring private development of apartments, a hotel, grocery store and a slave heritage site. Days after his second inauguration, Jones redirected the city's attention to that which few want to discuss: the ugly roots and wide scope of Richmond's 26-percent poverty rate. That rate has increased during Jones' tenure, much of which has taken place during the long climb out of recession. The release of his Anti-Poverty Commission's voluminous and troubling report launched months of ongoing behind-the scenes work to develop proposals for this year's budget. It also brought favorable front-page coverage in the New York Times. A month later, in February, Jones was alongside Gov. 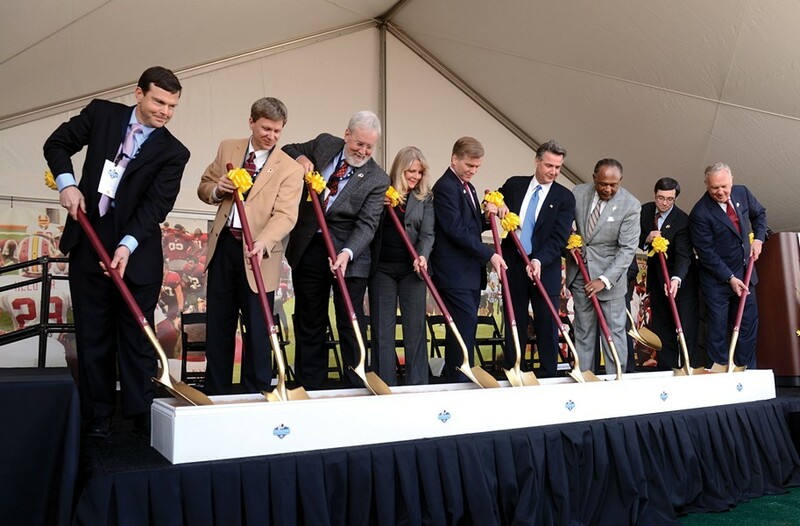 Bob McDonnell at the groundbreaking of the Redskins Training Camp, which the administration seized as an opportunity, completing the work with near-miraculous speed. The city paid almost $11 million up front to build the training site and will pay another $4 million "local contribution" over the eight-year term of the contract to an NFL franchise that Forbes valued at $1.7 billion last August. It remains to be seen whether that investment will pay off in the long run, but that didn't seem to matter in the torrent of free publicity and frothy boosterism it unleashed. The camp also polled more popularly in the counties than the city, and brought charges from an independent, black-owned newspaper, the Richmond Free Press, that given the team's controversial name, Jones is promoting racism. But the mayor's biggest and most divisive move in 2013 was his push to move the home of the Flying Squirrels off of Boulevard and into historic Shockoe Bottom. The relocation would open 60 acres of freeway-close, prime Boulevard space to development. It would also put the city-financed ballpark and associated private development of a hotel, apartments, grocery store and other retail within a stone's throw of known archeological slave sites in a neighborhood once home to the country's second-largest slave-trading district. The mayor has vowed to protect those slave sites, a move embraced by some and seen as a palliative by others. With the Shockoe Bottom project the mayor who call himself a risk-taker finally emerged. Joined by Chief Administrative Officer Byron Marshall, Mayor Jones names law-enforcement veteran Ray J. Tarasovic as the city’s new police chief Feb. 12. Tarasovic replaced Bryan T. Norwood, who was hired just before Jones was elected in 2008. The relationship between Jones and Norwood was such that the former police chief began searching for work elsewhere, eventually resigning. "Shockoe Bottom is the biggest thing he's ever done in the sense of 'I'm going to make this happen,'" says Paul Goldman, a former state Democratic Party chairman and adviser to Wilder. "It's the biggest play he's ever made." The Shockoe Bottom plan has proven polarizing and in that vast plain between unabashed support and unequivocal opposition, reside those still unconverted to either point of view, skeptics uncertain of the merits of any of the mayor's plans, his intentions, his vision, his math. Debate over his proposals rages across social media channels, on newspaper comment boards, at public meetings. "No one is putting their kids through college selling peanuts at a minor league baseball game." "He mentioned poverty nine times in his State of the City address and he didn't mention wealth once. No one wants to hear "poverty." White people feel guilty about it. Black people don't want to be it." "I oppose subsidizing a new stadium with taxpayer money in any location until such time as the city remedies the years of neglect and begins to provide effective, efficient, basic core city services for which it is responsible." Raymond Boone, the founder, publisher and editor of the Free Press — and a one-time Jones supporter — argues the training camp deal and Shockoe Bottom plan demonstrate the mayor has left the path of economic and racial justice. The deals, he says, ensure that the main beneficiaries of the new Richmond will be its old corporate elite. "And as for the poverty plan, listen, this is an old scheme," Boone says. "If there's a problem, they shift it to a commission and move it away from the mayor as a responsible official. Anyone who knows anything about politics won't be duped by this. The deal is this: Use the power you have now to turn things around. Give us the feeling that we have someone on our side." Mayor Dwight C. Jones accompanies Sheriff C.T. 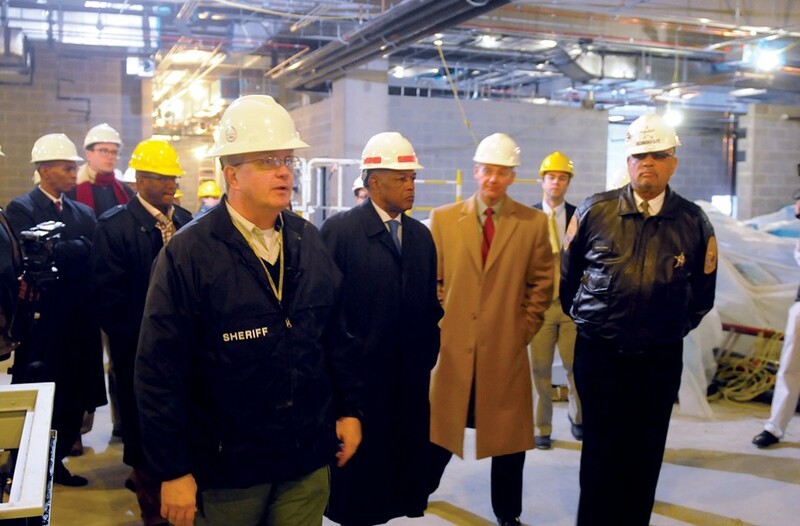 Woody on a construction tour of the city’s new jail in December 2012. Richmond’s previous leaders long had discussed the need to replace the city’s old jail, which was overcrowded and in poor condition, but the project was hampered by a state funding formula that encouraged regional jails and by the surrounding counties’ unwillingness to cooperate with Richmond, according to the Rev. Ben Campbell in his book, “Richmond’s Unhealed History.” The jail is expected to open to a full house in February. 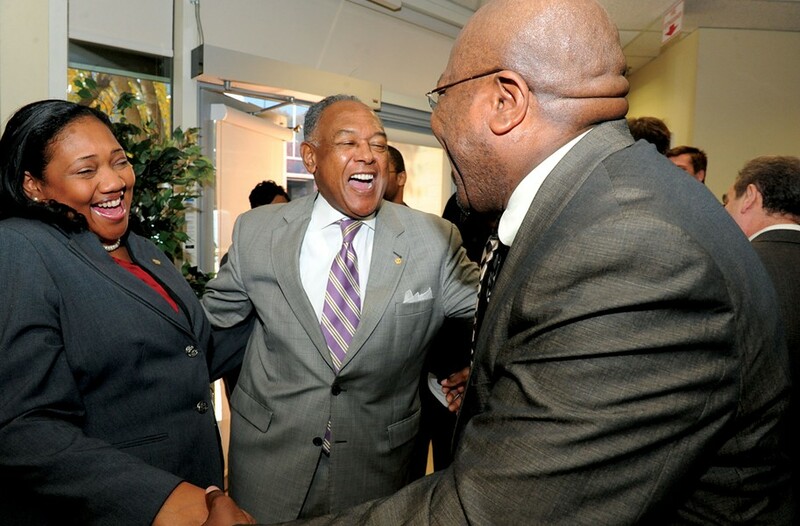 In the tenure of Mayor Jones, 2013 calls for a step back — a look at the sweep of the network he assembled. Take last year's ribbon-cutting at mixed-income housing on the site of the old Dove Court projects. This is the model for future public housing project redevelopment, led by his choice for the head of the Richmond Redevelopment and Housing Authority and his handpicked deputy chief administrative officer for economic development and planning. Take the positioning of a successful slate of new Richmond School Board members, which include his son, Rev. Derik Jones, and a former deputy chief of staff, Jeffrey Bourne — who also became the board chairman and works as a government relations liaison for the housing authority. Add Jones' backing of successful newcomers to Richmond City Council last year — at least one of whom likely hasn't worked out the way he wanted. The moves took out vocal critics of Jones on both boards. Political maneuvering also preceded the ouster and replacement of the police chief and school superintendent. "Jones succeeded where Wilder failed in consolidating not only his own political position, but the reach of mayor's office into the City Council, the School Board, the public housing authority," says Thad Williamson, an associate professor of leadership at the University of Richmond and the primary author of the poverty report. "In a low-key way, Jones and his team have systematically gone about trying to build the basis for an effective executive-driven local government." Which is still new for Richmond. "Jones is only our second popularly-elected mayor," Goldman says. "And one of the things about Richmond is that no one has really decided what they want from the mayor. You want him to fix schools? Well, he's not doing that. Crime? Wilder took care of that. Poverty? If you're serious about poverty you have to fix the school system. The city's bond rating has increased, that's an accomplishment. He hired a lot of people, consolidated departments, and did a good job there. The stadium, that's a big deal. But I don't think the mayor has had that moment of definition." Mayor Jones, third from right, with City Council President Charles Samuels, Gov. Bob McDonnell and his wife, Maureen, and other officials help break ground Feb. 14 on the team’s training camp in Richmond. Jones, a former state delegate and School Board member, said from the start that he was going to focus largely on three areas, each a generational endeavor: improving the public schools, expanding opportunities for Richmond's poor and jump-starting aggressive, strategic economic development to boost the city's anemic tax base. "Because of territorial lines, we forget we're not spending our money in the city of Richmond," Jones says. "We don't think about the fact that when you want something you have to go outside the city. On the North Side of Richmond, you have virtually no retail. People forget Willow Lawn is in the county. We're not trapping any of our potential revenue in the city and we need to be deliberate about that and we need to do that with all deliberate speed." Jones' focus on economic development has won him allies among corporate movers and shakers in Richmond who formerly didn't support him. This cooperation also has put him in the middle of another old battle in the city: that between black political power and white economic power. It doesn't escape the attention of some members of the black community that an economic power structure that first drew its wealth from the sale and ownership of slaves set the foundation for the economic power structure pushing a redevelopment plan on the same land where those sales took place. Kim Scheeler, president and chief executive of the Greater Richmond Chamber, says he's aware of the larger historical tension. "I hear rumbling, but I haven't seen it personally," he says. "Certainly there hasn't been a sense of, 'Who do you think you are and what are you doing here?' The mayor has done a good job of bridging that gap." Scheeler says he's been most impressed with Jones' long-range focus, his push for urban revitalization in a Richmond that's attracting many young professionals. That influx is key, says LaMar Dixon, president of the Richmond Crusade for Voters: "The mayor understands that he is overseeing the transition of the old Richmond to the new." Mayor Jones takes part in the ribbon-cutting ceremony for the Center for Workforce Innovation in November. It’s a key part of his strategy to reduce the city’s 26-percent poverty rate by preparing people for existing and in-demand jobs. Richmond's population has grown by at least 6,000 people since the 2010 U.S. Census. It now tops 210,000, the largest it's been since 1986. National and international publications singled out Richmond as a best city for jobs, an up-and-coming city for entrepreneurs and a top destination for 2014. Its food and beer scene are drawing national attention. "Richmond," Jones likes to say, "is cool again." But Richmond is also a city in which 40 percent of children live in poverty. More than half of the city's poor are concentrated in a handful of neighborhoods, what the mayor calls the "Tale of Two Cities." It's a city constricted in its inability to annex land for tax-generating development and by the lack of regional transportation to carry its workers to jobs. It occupies a band of the South in which social mobility rates are among the country's lowest. And it's a city preoccupied not only with its past, but also by that preoccupation. A circular debate is constantly swirling around how Richmond perceives itself and is perceived by outsiders, what it was, is, could be, should be. Richmond "is conflicted by its old-money roots and new money aspirations," business and leadership consultant James Crupi wrote in "Putting the Future Together," his controversial 2007 assessment of the city. "It is proud of the past and embarrassed by it. It wants to grow but doesn't want to change. It yearns for the reputation of Atlanta and Charlotte, but doesn't want to be like them." Jones governs amid these contradictory impulses, and he does so with Crupi's warnings in mind. His oft-used phrase, "Richmond will grow by design or default," comes from the report. "Crupi did a very good job of identifying the issue Richmond has of almost an inferiority complex," Jones says, "an unwillingness to have a sense of self, the ease with which we say no, our resistance to saying, 'yes.'" In that light, the mayor's big plays of 2013 are as much about changing a way of thinking as they are about poverty reduction and economic development. "If we can prime the pump and establish a culture where this is accepted strategy for the future, then it won't matter so much who is sitting in this chair," he says. "It becomes part of our values and finally we recognize that we are not the 'Tale of Two Cities,' because that's unacceptable." The question is whether this mayor can sell that message. "People wanted a visionary [in Doug Wilder] and they got a street fighter," says community activist Art Burton, a Jones supporter. "They still want a visionary." The mayor hasn't done a good enough job of articulating his vision, Burton says: "I don't know if his truly unassuming style really works." This, perhaps, is the most commonly heard criticism of Jones. It goes to a public diffidence that can come across as detachment. It speaks to the way he holds himself at a distance, security guards at watch. Jones is as careful with his speech as he is with his dress — and his facial expressions rarely give anything away. Mayor Jones congratulates City Councilwoman Reva Trammell on her re-election at the City Council swearing-in ceremony in January 2013. A South Sider as is the mayor, Trammell is one of his frequent critics. At last year's ribbon-cutting for the Center for Workforce Innovation, a critical piece of the mayor's anti-poverty strategy, Jones stayed after the ceremony, after the interviews, after the cake, and strolled into a classroom to talk with unemployed men and women. It was a side of the mayor not often witnessed in public — the pastoral side of the man who's served as long-time pastor of First Baptist Church of South Richmond, who has a quick sense of humor, who, during his first inaugural speech, let slip an "amen" and, startled, sheepish, covered his lips with his fingers as if to pull back the word. That Jones has proven so adept at compartmentalizing his public and private selves is the city's loss, some supporters say. "My style is my style," Jones responds, "and, you know, as far as I'm concerned, it's working real well. I'm only one man so it's difficult for me to be everywhere people want me to be and do everything people want me to do." "People said they didn't want a Doug Wilder and that's what they got," City Councilwoman Ellen Robertson says. "The mayor feels no need to draw attention to himself. I think some of this sense of wanting more of him comes from people who have seen in him someone who has the capacity to erase the lines that divide this community." Still, she acknowledges, the administration would benefit from "stronger civic representation." Case in point: The Shockoe Bottom plan. It officially was unveiled in November but was crafted over months out of the public eye and then rolled out with the mayor's admonition that it was an all-or-nothing deal. Take it or leave it. "I hate this all-or-nothing baloney," a woman told Jones at a recent public presentation of the plan. "I love the mayor like a brother and I'm not about trying to throw him under the bus," says Lillie A. Estes, a community strategist, member of the Citizens' Advisory Board to the Maggie Walker initiative and public housing resident. He is genuine but the process has been flawed, she continues: "All this language: mixed-income housing, deconcentration of poverty. AstroTurf is green but it ain't grass. "If you really want community input, then do everything to get the community in the room. Come out here. Leave the suit. Put on some jeans and help the people who live in poverty understand where they are now and how they can get better, and they can carry that forward to the next administration. There's a lot of talk from the mayor about moving into the future. Who gets to move with him into this future?" The mayor answers this way: Somewhere in one of the housing projects is a young pregnant woman. If all goes as he hopes, her child will grow up not within the cinder block walls of an isolated housing project but in a neighborhood of teachers and secretaries and sales clerks and warehouse workers and firefighters, with "models of success and not failure." Mom will get the city-offered guidance that will steer her toward a career while her child will attend stronger schools, prepared to enter college with the help of a city scholarship program that will cover everything other financial aid won't. "And, one day," he says, "when that child is grown, he or she will be able to say, 'We pulled ourselves out of this thing. …"
The women and men who reenergized the women's rights movement. Virginia Commonwealth University men's basketball coach. The outsiders who brought them here, and the team that brought us together. Bryan, Kathryn, Stella and Ruby. Executive director, Greater Richmond Chamber of Commerce. Artist, fundraiser, Arthur Ashe monument. Grocery magnates and community leaders. Former governor and lieutenant governor. Future lieutenant governor and governor.